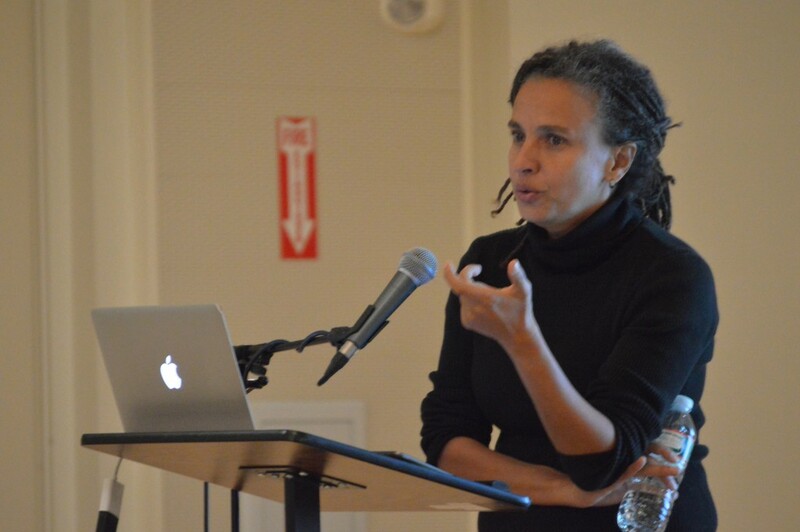 Professor Fatima El-Tayeb of University of California at San Diego gave a lecture on the intersectionality of race, religion and sexuality, as well as the persistence of racism in Europe, at the Interfaith Center Tuesday evening. The Nov. 17 lecture, titled “Queer Life of Diaspora,” was hosted by the Consortium of Studies for Race, Colonialism and Diaspora (CSRD) and the Tufts LGBT Center. The event was organized by Lisa Lowe, a professor of English and the director of the Colonialism Studies program, and Nino Testa, director of the LGBT Center. Testa said that the talk was particularly relevant to the way recent ISIS bombings have been covered in the media. Lowe began the event by introducing El-Tayeb, who is her former colleague. El-Tayeb began her talk by explaining that the title of the lecture represents an adoption of terms that were once used to separate minorities from the rest of the population. She went on to speak out about Europeans who believe that they are above racism, while ignoring Europe’s own racist history. According to El-Tayeb, although the history of racism in Europe is different than the history of racism in the United States, it is no less fraught. El-Tayeb also talked about the current European refugee crisis in relation to the history of colonialism, pointing out what she sees as the hypocritical comparison of refugees to barbarians. “In discussions around the refugee crisis, the most used comparisons are the barbarian invasions, but something that surprisingly is never mentioned is the fact that 85 million Europeans left the continent in a relatively short period to invade other parts of the world that had no say in whether they wanted to accept those people,” she said. El-Tayeb went on to speak about the racialization of Muslims in Europe, discussing the anti-hijab laws in several European nations and what this means for European Muslims. El-Tayeb explained that the level of outcry against the hijab seems disproportionate given the relatively small population of Muslims in these countries, until they are viewed from an anti-Islamic standpoint. El-Tayeb concluded her speech with a discussion of the current lack of intersectionality between racial and sexual identities, saying that racial and sexual minorities are often seen as mutually exclusive. El-Tayeb, who was born in Germany, explained that she became involved in the discussion around queer diaspora and intersectionality because of her desire to find a place for herself and her identity.